Experience is applied over player skills. 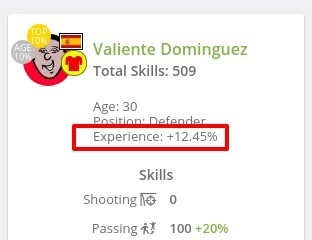 For example: If a player has 5% experience, he will perform 5% better in every skill. Players gain experience when playing matches. For 90 minutes, they get 0.05 experience. If they play more or less minutes, they will get more or less experience, depending from minutes they played. Players get double experience if then play in National Team games.